The McCandless M4 was a British single-seater ultra-light autogyro first flown in 1961. The original McCandless M4, developed by Rex and Cromie McCandless, was powered by a Triumph motor-cycle engine, this was later briefly replaced by a Norton motor-cycle engine which was abandoned in favour of a Volkswagen flat-four four-cylinder horizontally-opposed air-cooled engine which could be connected to the propeller without gears. 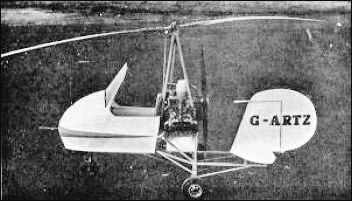 W. H. Ekin (Engineering) Company Ltd was formed at Crumlin, Co. Antrim, Northern Ireland, March 1969 to undertake production of six McCandless gyroplanes. The first one flew in February 1972. Extensive redesign was then undertaken and new prototype flew February 1973. Modified type called WHE Airbuggy. There were two prototypes, one M1 and one M4 at the Ulster Folk and Transport Museum. One flying VW engine-driven M4 type had the registration EI-ASR. In total there were 8 built.